These days our house is filled with cars, trucks and trains. How Mason loves toys that he can roll along and create new adventures with. Chuggington Wooden Railway Over& Under Starter Set with Clock Tower is the latest toy Mason helped me to review. He was so excited just when I pulled the box out and saw that it was Chuggington Trains. He immediately went into a chorus of "choo choo", "choo choo". 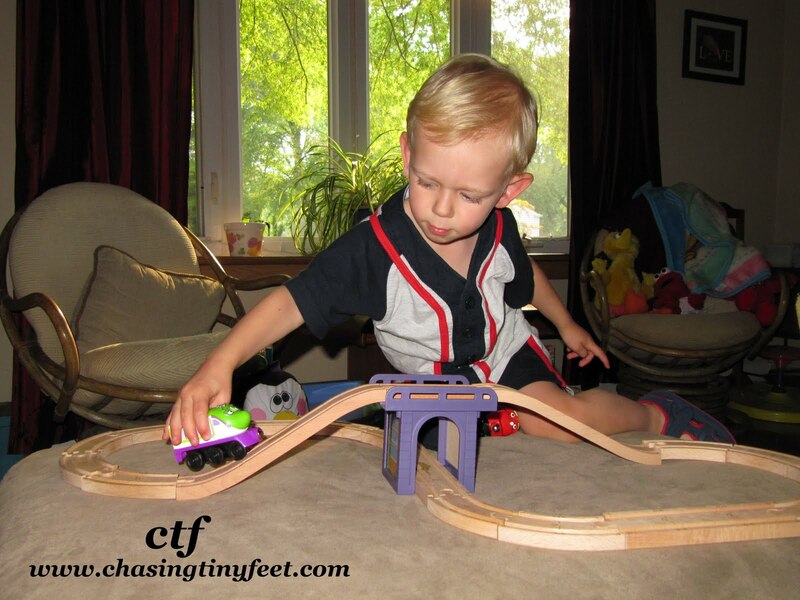 If you are not familiar with Chuggington, it is based on the animated TV series for pre-schoolers. Stories reinforce early preschool skills like color, verbal skills, and taking and understanding directions. Along the way, you will meet characters who are "train"ees named Wilson, Brewster, and Koko. "Chuggers", or the more experienced engines, will help to teach important social skills, like paying attention, being a good friend, and believing in yourself. Your child will also learn "positive life lessons", as well as, "social readiness skills" like honesty, friendship, patience, and being a good listener. Kids will easily relate to the trainees, the challenges, and mistakes they face along the way. The Over& Under Starter Set is a 22 piece set that features a 2 in 1 Clock Tower which can be used to stack as a tower or unstack to create two separate tunnels. This stackable tower creates more ways for your little one to be creative and use their imagination. The track is designed to set up in a figure 8 design, but it can be configured in other ways also. Setting up the track was very easy and appropriate for the 3 and up crowd. It wasn’t hard to figure out how to put together. 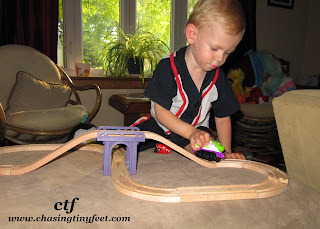 With minimal help from me, Mason had no problem setting up the track himself. I love the high quality, real wood construction of this set. There are so many toys, while fun and even educational, that will simply not stand the test of time, or the test of a 2 or 3 year old. I still have my Lincoln Logs from when I was a child and I know they held up because they were made of real wood. The overall design of this wooden track system is compact and does not take up a whole lot of space. Another nice feature of this play set is that the Chuggington wooden track is compatible with other wooden train systems, such as Thomas. The trains are very colorful and have a chunky design. This paired with the strong magnetic coupling system make this a perfect set for any toddler! Also included in the Over& Under Starter Set are Chuggington characters Wilson, Koko and Vee. It is recommended for ages 3 and up and retails for about $49.99. This train set was named as an Oppenheim Toy Portfolio “Gold Seal” winner. To find out more about Chuggington or to find other Chuggington Wooden Railway Sets, check out the Official Chuggington Online Store. Learning Curve provided the item above in order to facilitate this review. All opinions are 100% mine.